The Bahamas is an archipelago of hundreds of islands and cays stretching southeast from Florida and north of Cuba. Settled by the British as early in 1648, the islands became a notorious pirate hangout in the early 1700s. Britain cleaned out the pirates and re-established a colony in 1718. The islands then remained under British sovereignty until they became independent in 1973. At the far southeastern end of the archipelago the Turks and Caicos Islands were separated from the Bahamas in 1874 and remain a British colony today. All the islands are low and sandy; their beautiful beaches have made them a mecca for vacationers from the U.S. and many other countries. The most heavily developed islands are at the northern end of the archipelago, closest to the U.S. The capital, Nassau, occupies New Providence Island and has more than 70% of the population of the country. 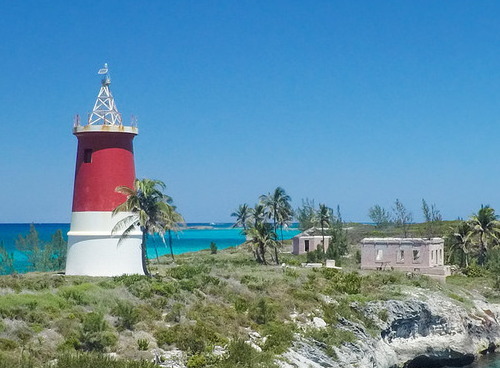 Lighthouse preservation is a matter of considerable concern in the Bahamas. A few of the lighthouses are well-known tourist attractions and seem well maintained, but many others are isolated, rarely visited, and in poor condition. 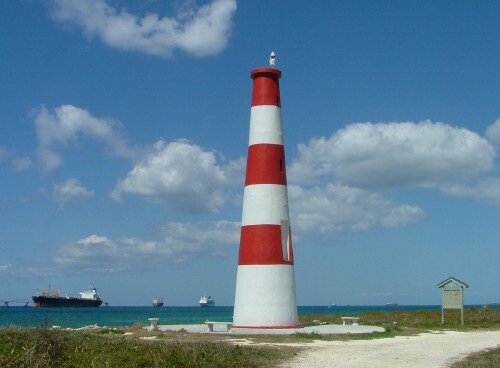 The active lighthouses are operated by the Bahamas Port Department. Photos and current accounts of visits to many of these lighthouses are relatively scarce on the Internet. I'd be happy to receive information or photos you'd like to share. ARLHS numbers are from the ARLHS World List of Lights. Admiralty numbers are from Volume J of the Admiralty List of Lights & Fog Signals. U.S. NGA numbers are from Publication 110. Online navigation charts for the Bahamas. Note: The Abaco Islands are at the northeastern corner of the Bahamas archipelago. The narrow island chain is about 200 km (125 mi) long and has a permanent population of aboout 13,000. Marsh Harbour on Great Abaco Island is the largest town. The Abacos are accessible by air, and cruise ships often call there. 1864. Active; focal plane 37 m (121 ft); five white flashes every 15 s. 27 m (89 ft) round masonry tower with lantern and gallery. 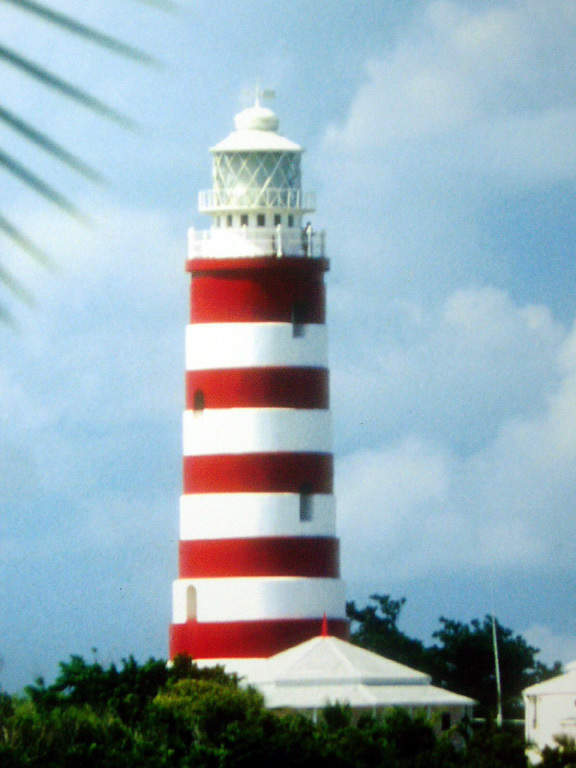 Lighthouse painted with horizontal red and white bands; lantern painted white with a gray metallic dome. Revolving 1st order Fresnel lens (transferred from Gun Cay in 1936). Ernest Lehmann's photo is above, an excellent closeup and a view from the harbor are available, Bruce Tuten has a good view of the entire station, Trabas has a photo, Marinas.com has aerial photos, James Grove has a street view from the gallery, and Google has a satellite view. 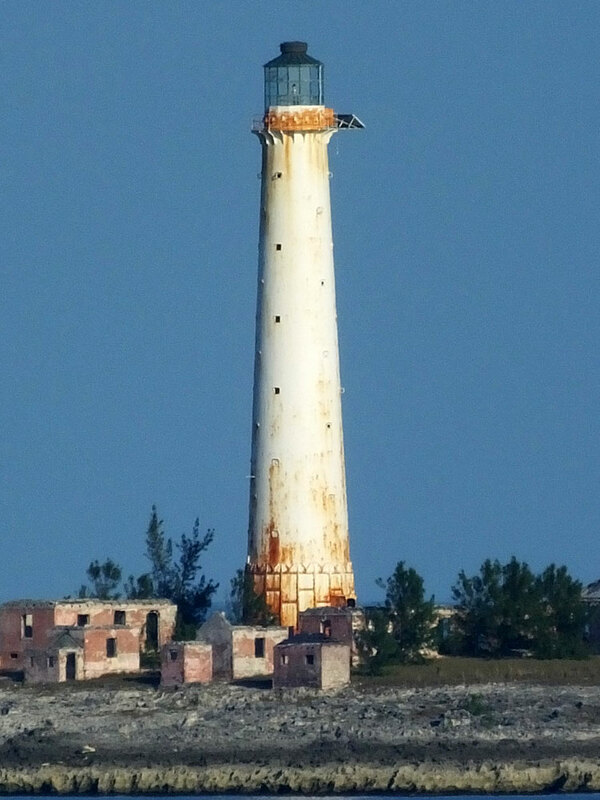 This is probably the most often visited lighthouse of the Bahamas. The light is fueled by kerosene, and keepers still hand-wind the clockwork mechanism every two hours throughout the night. 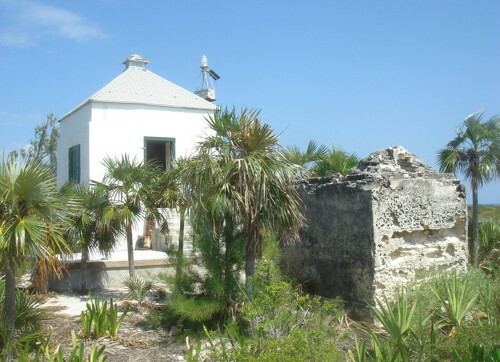 The Elbow Reef Lighthouse Society (formerly The Bahamas Lighthouse Preservation Society) works for the restoration and maintenance of this historic light station. In 2015 volunteers restored the lantern roof, and in 2016 the lantern glass was replaced. 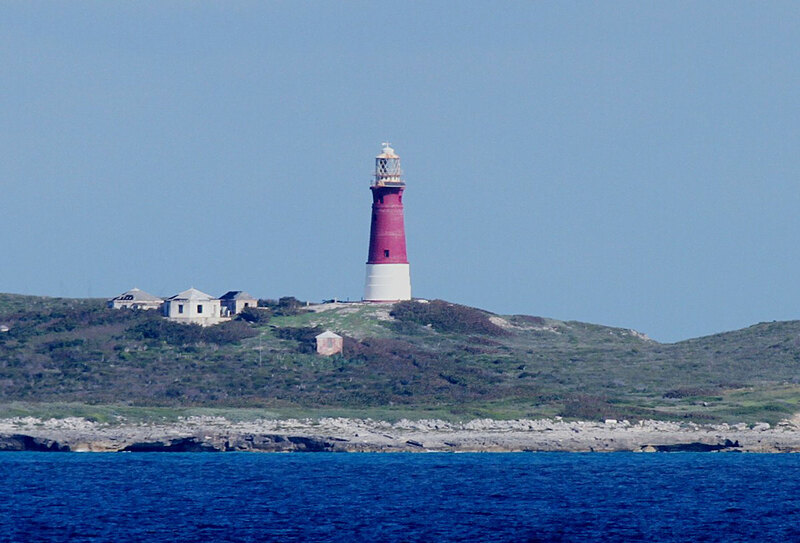 The 150th anniversary of the lighthouse was celebrated in June 2014. Located on Elbow Cay on the west side of the harbor at Hope Town. The island is accessible by ferry from Marsh Harbour. Site open, tower open daily except Sundays. Site manager: Bahamas Port Department. ARLHS BAH-010; Admiralty J4572; NGA 11800. Date unknown (station established 1889). 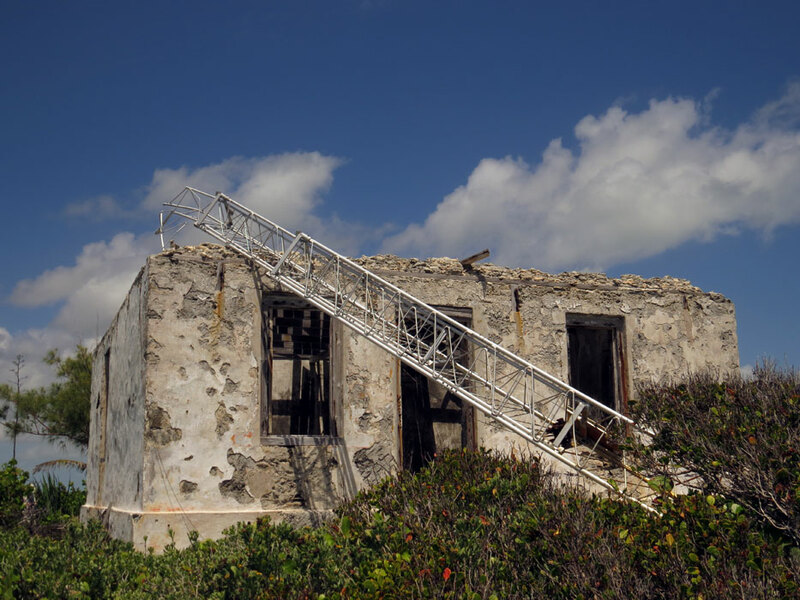 Probably inactive but listed by the Admiralty and NGA with focal plane 19 m (62 ft); white flash every 4 s. Ruins of a 1-story concrete keeper's quarters, known locally as the "old lighthouse." A modern steel framework tower carried an active light until it was blown over by Hurricane Sandy in October 2012. Trabas has Darlene Chisholm's photo of the toppled light, and Google has a satellite view. It's possible the light has been restored; we need more information. Located at the entrance to Little Harbour, about 25 km (15 mi) south of Marsh Harbour, Great Abaco Island. Accessible by a short walk to the end of the peninsula sheltering the harbor. Site open, tower closed. Site manager: unknown. ARLHS BAH-021; Admiralty J4576; NGA 11808. 1836. Active; focal plane 51 m (168 ft); white flash every 10 s. 28 m (92 ft) round British old-style stone tower with lantern and gallery, attached to keeper's quarters buildings. Upper 2/3 of tower painted red, lower third white. Dexter Russell's photo is at right, Craig Nash has a 2010 photo, Lightphotos.net has a photo by Capt. Peter Mosselberger, Marinas.com has fine aerial photos, Trabas has a view from the sea by Capt. Theo Hinrichs, Benjamin Eddy has a street view from the base of the tower, and Google has a satellite view. The lighthouse, built in 1836 to mark the entrance to the Northeast Providence Channel, is one of the best examples of old-style British lighthouse architecture in the New World. 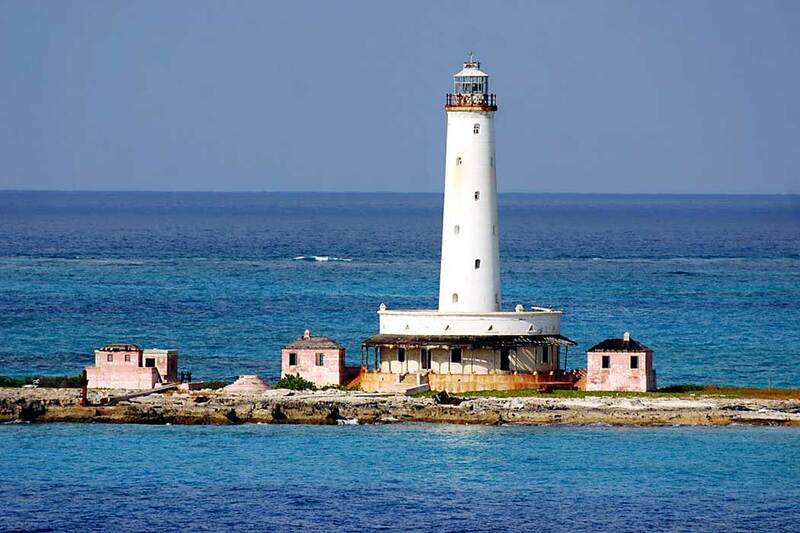 It is not the oldest lighthouse in the country (the 1817 Paradise Island Light in Nassau has that honor), but it was the first lighthouse built in the Bahamas by the Imperial Lighthouse Service. As late as 1995 it was still fueled by kerosene and lit every night by resident keepers. 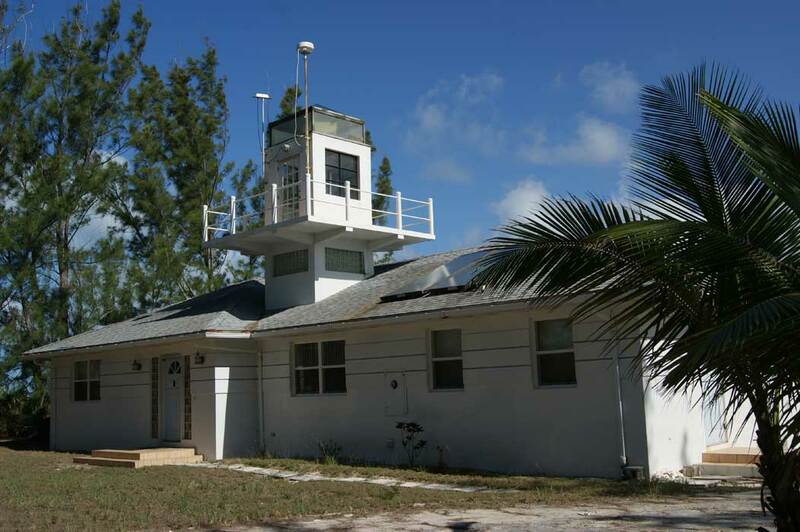 Today the light station is leased to the Bahamas Marine Mammal Research Organization as a marine research facility. The lighthouse itself was modernized and automated in 1995; the Center for Whale Research has a closeup photo (halfway down the page) taken before the restoration. 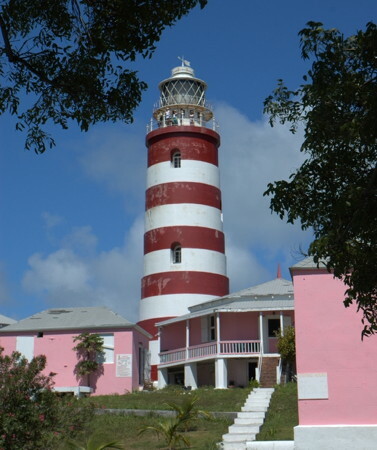 In 1994 a large area surrounding the light station was set aside as the Abaco National Park. The name "Hole-in-the-Wall" referred to a limestone arch at land's end near the lighthouse. Unfortunately, the arch collapsed in October 2012 as Hurricane Sandy raged over the island. Located at the southern tip of Great Abaco Island. Accessible by boat or over a rugged road by 4WD vehicles. Site open, tower reported open. Site manager: Bahamas Marine Mammal Research Organization. ARLHS BAH-004; Admiralty J4580; NGA 11816. Note: Among the major islands of the Bahamas, Grand Bahama is the closest to the U.S., lying about 90 km (55 mi) east of Palm Beach, Florida. The island is nearly 160 km (100 mi) long west to east and has a population of about 75,000. It has numerous resorts very popular with Americans. Tourists often photograph the Lucaya lighthouse at Freeport and the High Rock lighthouse at High Rock, but these are faux lighthouses, not aids to navigation. Around 1960 (station establishment date unknown). Inactive ca. 2006-2009 and since 2014. 12 m (40 ft) round cinder block tower, painted with red and white horizontal bands. Larry Myhre contributed the photo at right, Andrew Conway has a closeup photo, Terrance Roberts has a street view, and Google has a satellite view. The tower is dwarfed by a modern industrial chimney. 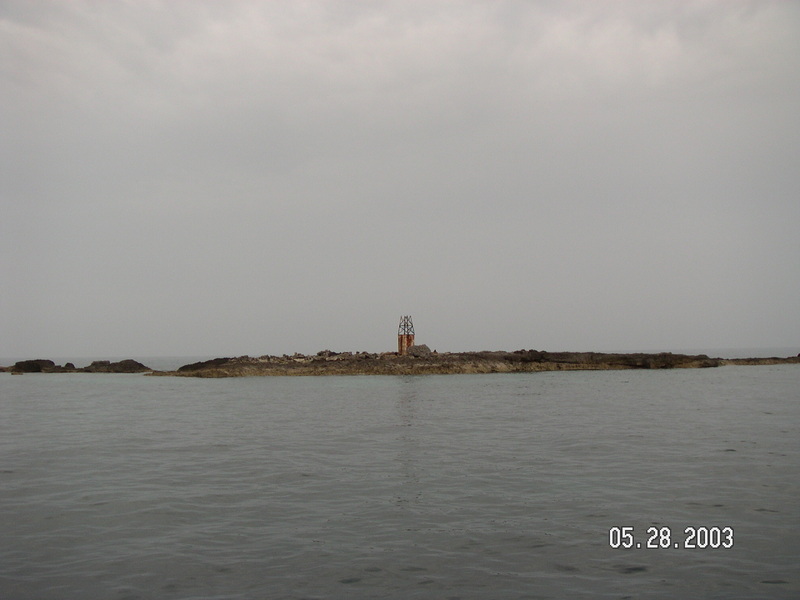 According to a historical marker at the site, there was a 19th century lighthouse at or near this location; older Admiralty lists describe a short skeletal tower listed as Eight Mile Rock Light. The historical marker also says the current tower was built in the "mid 1900s." Probably this was in connection with the development of Freeport Harbour, which began in the late 1950s. 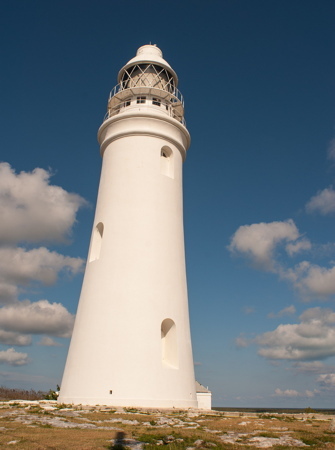 Sometime before 2007 the light was removed from the lighthouse, and during 2007 its traditional red and white bands were covered by white paint, as seen in Conway's November 2007 photo. The lighthouse had this same appearance as late as September 2008, as seen by another photo. In early 2009 the tower was restored and relit, and benches and the historical marker were installed. 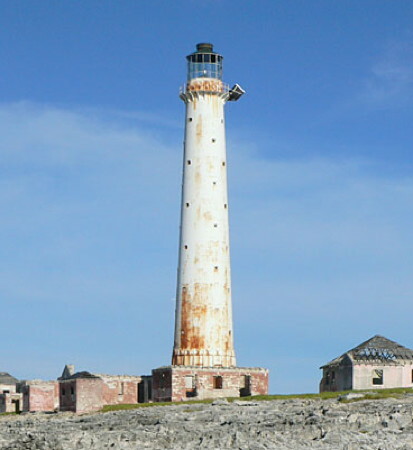 In 2013 the lighthouse was designated a Grand Bahama Heritage Site. However, the Admiralty reported in April 2014 that the light has been deactivated once again. Located on a prominent cape on the southwestern coast of the island, about 2 km (1.25 mi) southeast of the entrance to Freeport Harbour. Site status unknown. ARLHS BAH-024; ex-Admiralty J4594; ex-NGA 11848. 2013. Active; focal plane 49 m (161 ft); continuous green light. Approx. 45 m (148 ft) triangular skeletal tower painted with red and white horizontal bands. The tower carries two rectangular daymarks painted red with a white vertical stripe. No photo available but Google has a satellite view. The range guides vessels into the container port and cruise ship harbor of Freeport. These range towers replaced a pair of much shorter towers. Located at the end of the container ship channel west of Pinder's Point. Site status unknown, but the tower can be seen from nearby. Admiralty J4595; NGA 11880. 2013. Active; focal plane 81 m (266 ft); continuous green light. Approx. 77 m (253 ft) triangular skeletal tower painted with red and white horizontal bands. The tower carries two rectangular daymarks painted red with a white vertical stripe. No photo available but Google has a satellite view. Located beside the highway at the rear of the contianer port, 1139 m (0.71 mi) north northeast of the front light. Site status unknown, but the tower can be seen from nearby. Admiralty J4595.1; NGA 11884. Note: The Bimini Islands are a group of small islands on the northwestern edge of the Great Bahama Bank, barely 80 km (50 mi) due east of Miami, Florida. 1859. Reactivated (inactive ca. 2000-2009?). 46 m (151 ft) round cast iron tower with lantern and gallery, painted white. 1-story keeper's house, abandoned and falling into ruin, and other buildings. Anthony Rue's 2007 photo is at right, Trabas has Capt. Peter Mosselberger's photo, and Marinas.com has aerial photos showing the sad state of the station, but Google has only a fuzzy satellite view of the cay. Clearly endangered. Marking the entrance to the Northwest Providence Channel, this lighthouse is a familiar landmark for cruise ship passengers en route to Nassau from Florida. Great Isaac is the scene of a famous lighthouse mystery: on 4 August 1969 the light station was discovered undisturbed but abandoned. Its two missing keepers were never found. 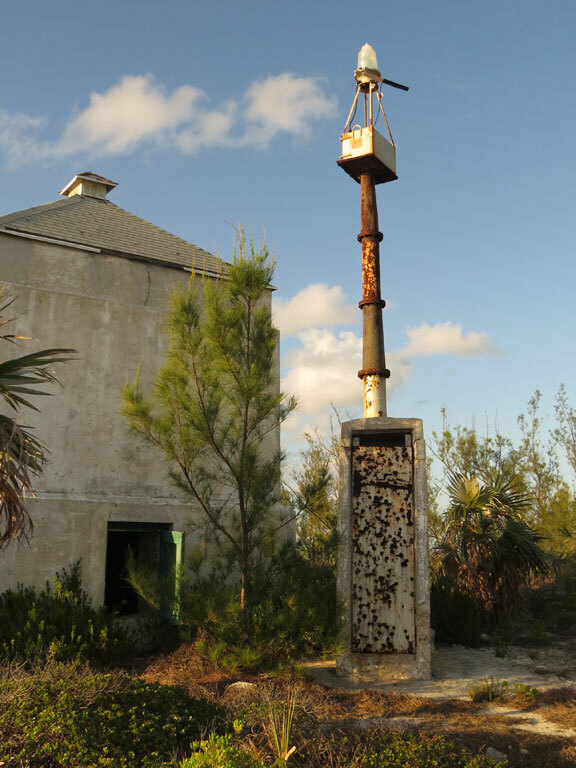 The lighthouse appeared to be gravely endangered in recent years: in 2005 Doug Nevitt visited the lighthouse and found it abandoned and rusting. The photo at right and a photo taken on New Years Eve 2007 show similar troubling conditions. Apparently, the lighthouse was repainted and relit sometime in 2008-09, although the lantern remains in poor condition with most of its panes missing. Located on Great Isaac Cay at the north end of the Bimini archipelago. Accessible only by boat. Site open, tower open but the lower section of the stairway was removed to discourage climbing the tower. Site manager: Bahamas Port Department. ARLHS BAH-002; Admiralty J4620; NGA 11900. 1836. Active; focal plane 24 m (80 ft); white flash every 10 s. 15 m (50 ft) round old-style stone tower surmounted by a short square pyramidal skeletal tower; upper half of tower painted red, lower half white. Two 1-story keeper's houses are abandoned and falling into ruins. 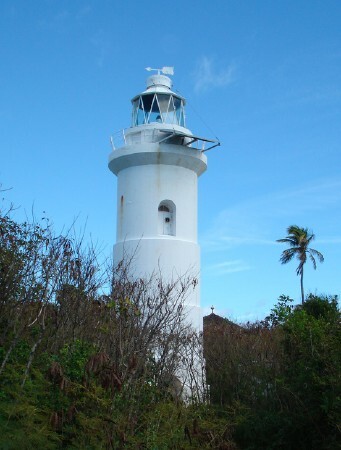 The original lantern was transferred to Elbow Cay in 1936. A photo is at right, Trabas has Capt. Peter Mosselberger's photo, a 2011 photo shows one of the ruined keeper's houses, Marinas.com has aerial photos, and Bing has a satellite view. 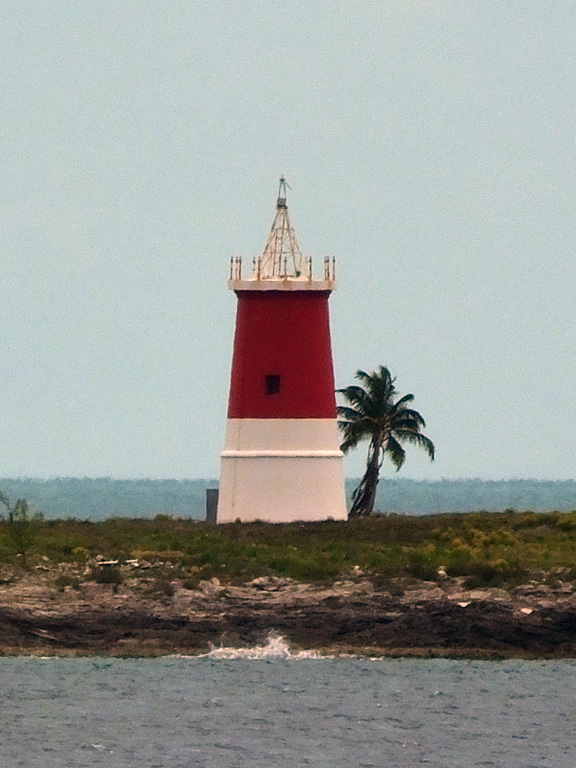 The lighthouse is visible from North Cat Cay. Located at the south end of the cay, one of the smaller islands in the Bimini group. Accessible only by boat. Site open, tower reported open. ARLHS BAH-009; Admiralty J4610; NGA 11916. 1933. Active (privately maintained); focal plane 6 m (10 ft); white flash every 2 s. 6 m (20 ft) round old-style masonry tower with a small open lantern. Lighthouse painted white with a black cat on the seaward side, lantern painted gold. Trabas has Darlene Chisholm's aerial photo and Google has a very distant satellite view of the harbor. Built by Capt. Leroy Smith for the owners of the island, the lighthouse is now owned by the Cat Cay Club. The original rubblestone breakwater has been replaced by a broad artificial peninsula that includes a landing strip for small planes. The island is just south of Gun Cay in the Bimini Group. It is privately owned, but the marina area is open to all boaters. Located at the east entrance to the harbor. Accessible only by boat. Site open, tower closed. ARLHS BAH-023; Admiralty J4608; NGA 11920. Date unknown. Active (? ); focal plane 11 m (36 ft); white flash every 5 s. This w as a 9 m (30 ft) square stone tower topped by a skeletal tower. The masonry tower is painted with red and white vertical stripes. A 2003 photo is available, the skeletal tower is missing in Capt. Peter Mosselberger's view from the sea, and Bing has an indistinct satellite view. Located on a reef about 35 km (22 mi) south of Gun Cay. Accessible only by boat. Site open, tower closed. Admiralty J4604; NGA 11924. Note: The Berry Islands are a chain of small islands in the central northern part of the Bahamas, roughly 100 km (60 mi) northwest of Nassau and the same distance southwest of Great Abaco Island. The permanent population is only about 700, but there are a number of resorts in the islands. 1863. Active; focal plane 25 m (82 ft); two white flashes every 20 s. 17 m (56 ft) round stone or brick tower with lantern and gallery, painted white. Two 1-story keeper's quarters and an oil house are in ruins. Kate Hooper's photo is at right, David Smith has a 2009 closeup, Ken Cobb has a February 2007 photo, Lightphotos.net has a photo by Robert English, Marinas.com has aerial photos, Trabas has a distant view by Capt. Theo Hinrichs, and Bing has a satellite view. 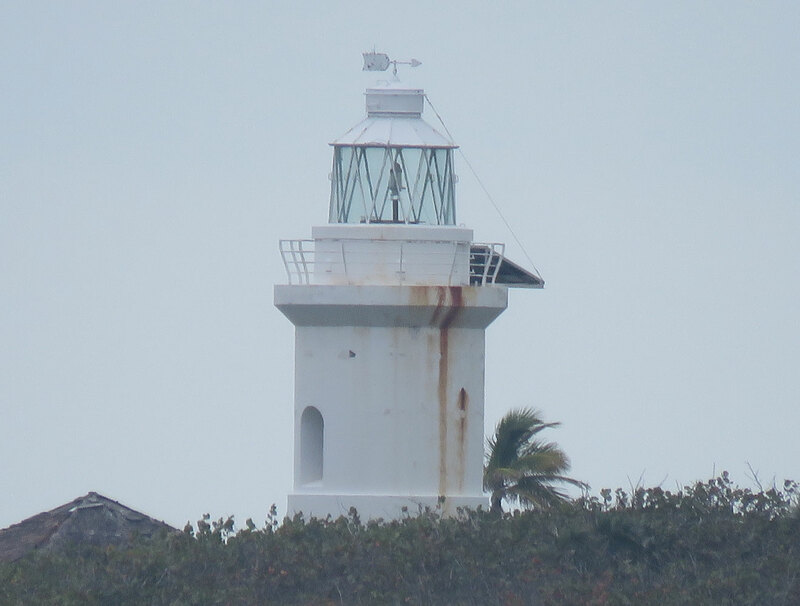 The cay is a regular stop for Norwegian Cruise Lines ships, so perhaps the cruise line has helped keep this lighthouse in good condition. Located at the northern end of the Berry Islands. Site open, tower closed. Site manager: Bahamas Port Department. ARLHS BAH-008; Admiralty J4624; NGA 11940. 1920. Clearly inactive, although still listed as active by the Admiralty and NGA. Approx. 13 m (43 ft) 3-story masonry tower attached to a 1-story keeper's house. The tower has been freshly painted white. A closeup photo and a view from the sea are available, Trabas has Darlene Chisholm's aerial photo, and Google has a satellite view. The island is a privately owned resort. The lighthouse was restored in the 1930s by the founder of the resort. 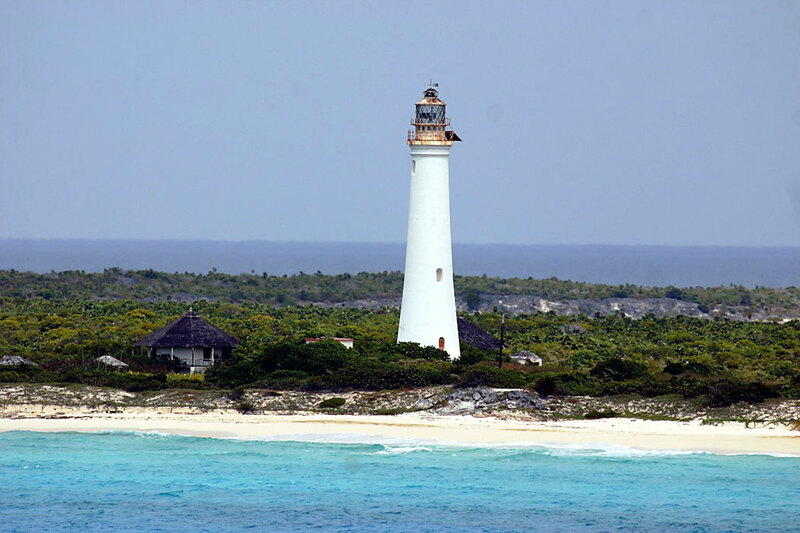 Located at the southwestern tip of Whale Cay at the extreme southern end of the Berry Islands. Site and tower private but open to resort guests. Site manager: Bahamas Port Department. ARLHS BAH-022; Admiralty J4626; NGA 11952. Note: Located southwest of Nassau, Andros is the largest island of the Bahamas, over 160 km (100 mi) long and as much as 65 km (40 mi wide). However, it is thinly populated and not well known to tourists. 1895. Inactive. Approx. 9 m (30 ft) square masonry tower with a crenellated top. Tower painted white, except for several narrow red bands on a short tower at the top. Dale Johnston has a June 2005 photo, Sherrine Thompson's 2010 photo shows the date 1892 carved above the door of the tower, and the tower is centered in a Google satellite view. Very little information on the history of this odd stucture is available, but it is listed as active in the Jenkins 1904 light list. According to one source, the short tower painted with red horizontal bands was added to the top of the tower in 1952. Located on the south side of the entrance to Fresh Creek in Coakley Town, about 5 km (3 mi) north of Andros Town on the east side of the island. Site and tower open. Site manager: unknown. ARLHS BAH-017. Note: Nassau, the capital of the Bahamas, has a population of more than 250,000 -- 70% of the population of the country. The metropolitan area encompasses all of New Providence Island. 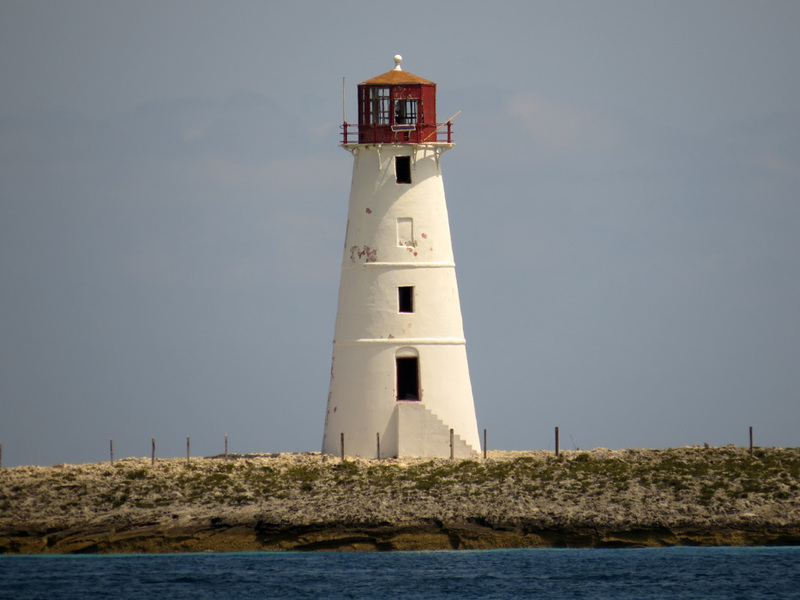 In addition to the official lights, Nassau has several well known faux lighthouses, including Solomons and Crystal Cay. 1922. Active; focal plane 11 m (36 ft); white flash every 2 s. 15 m (49 ft) triangular skeletal mast. Trabas has Darlene Chisholm's photo, and there is a faint shadow of the tower in Google's satellite view. Goulding Cay, a well known scuba diving site, is about 2 km (1.25 mi) west of the western end of New Providence Island. Located at the west end of the cay. Accessible only by boat. Site open, tower closed. Admiralty J4650; NGA 12076. 1817. Active; focal plane 21 m (69 ft); flash every 5 s, generally white, but the light changes to red when conditions are dangerous for entry. 19 m (63 ft) round old-style brick tower with lantern and gallery, painted white; lantern painted red. Alex Merwin's 2012 photo is at right, Colin Thomas's 2007 photo shows how the lantern was formerly painted white with a red roof, Trabas has Darlene Chisholm's 2013 photo, David Rodriguez has a street view from inside the lantern, Marinas.com has aerial photos, Huelse has a historic postcard view, and Google has a satellite view. 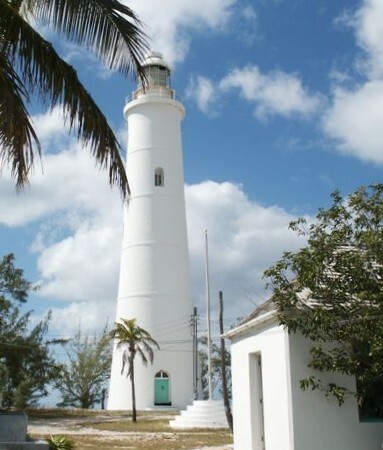 This is the oldest and best known lighthouse in the Bahamas and the oldest surviving lighthouse in the West Indies. Sadly, it is endangered. The lighthouse was in "deplorable" condition by spring 2015, with government agencies blaming each other for its neglect. 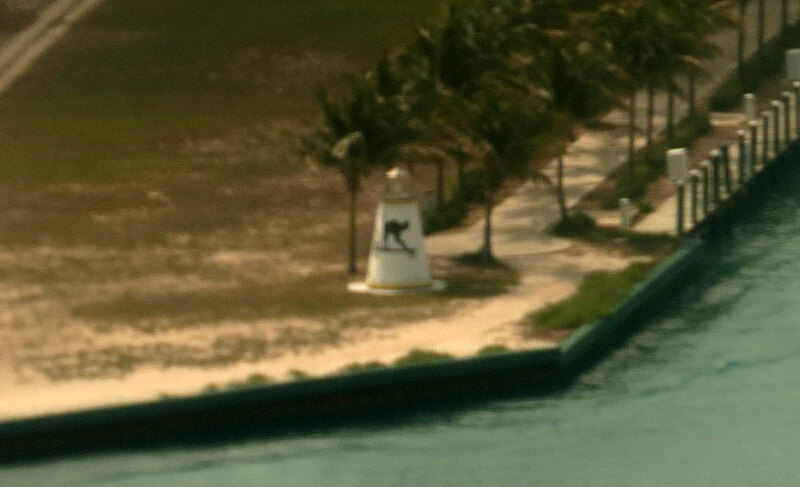 Located at the western end of Paradise Island (formerly Hog Island) marking the northwest entrance to Nassau Harbor. Site open, tower reported open (Hurricane Sandy smashed the door open in 2012 and reportedly it has not been replaced). Good view from cruise ships entering the harbor. Site manager: Bahamas Port Department (?). ARLHS BAH-014; Admiralty J4655; NGA 12084. Date unknown. Active; focal plane 37 m (122 ft); red flash every 3 s. Light displayed from the cupola of Government House in downtown Nassau. 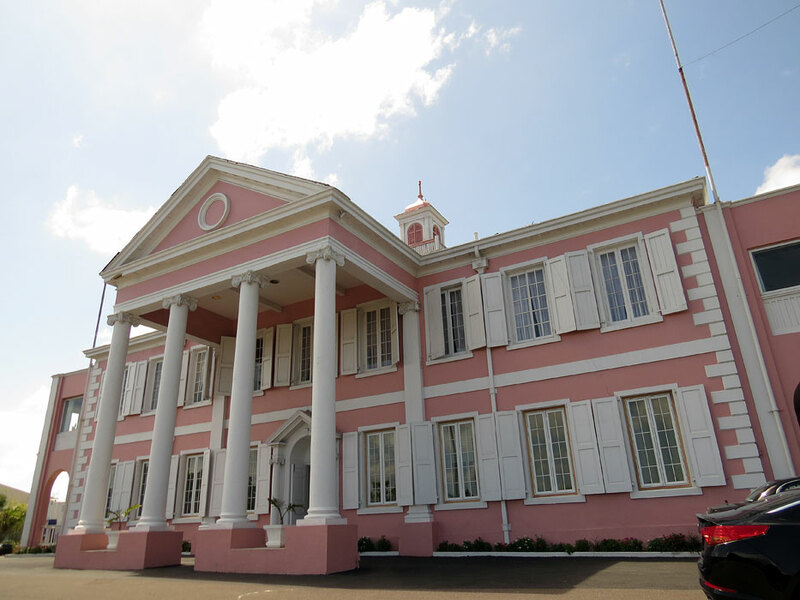 The building is painted pink with white trim. Trabas has Darlene Chisholm's 2013 photo, Natalie Wilkie has another photo, Leon Keyser has a street view, and Google has a satellite view. Located on Hill Street, about 3 blocks south of the waterfront in Nassau. Site open, tower closed. Site manager: Government of the Bahamas. ARLHS BAH-019; Admiralty J4658; NGA 12096. 1928. Reported inactive; listed with focal plane 67 m (220 ft); white flash every 5 s. 40 m (131 ft) round concrete water tower with a flat roof used as an observation platform. Entire tower is white. Trabas has Tom Chisholm's photo, Daniele Beber has a street view, and Google has a satellite view. 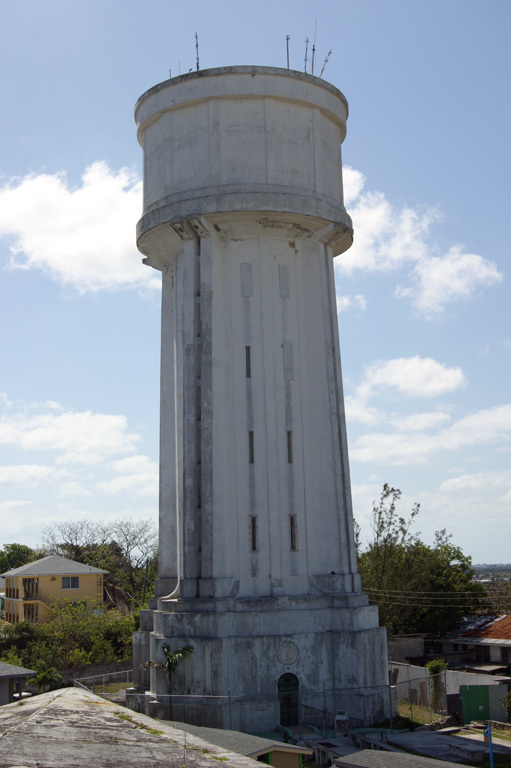 An elevator formerly carried tourists to the roof of this historic tower for a panoramic view of Nassau. The light is more for aircraft than for ships, although it may serve as a landfall light for the city. Recent visitors have reported this light is not operating. The tower was under renovation in 2017 and may be reopened when the work is completed. Located on Bennet's Hill, the highest point of New Providence Island, sharing the hilltop with Fort Fincastle (1793). Site open, tower reported closed. ARLHS BAH-012; Admiralty J4654; NGA 12080. 1909. Active; focal plane 17 m (56 ft); white flash every 6 s. 8 m (26 ft) 2-story square concrete building; the light is shown from a mast atop the structure. An enclosure projecting from the roof may have held a range light or directional light, but it is not in use at present. Darlene Chsisholm's photo is at right Trabas has her husband Tom Chisholm's photo, and the light is centered in this Google satellite view. Located on Yamacraw Hill Road at the eastern end of New Providence Island. Site open, tower closed. Admiralty J4669; NGA 12112. Note: Eleuthera is a very long, narrow island that traces the northeastern end of the Great Bahama Bank in the central Bahamas. The island has numerous resorts and is a very popular vacation destination. Date unknown (station established 1891). 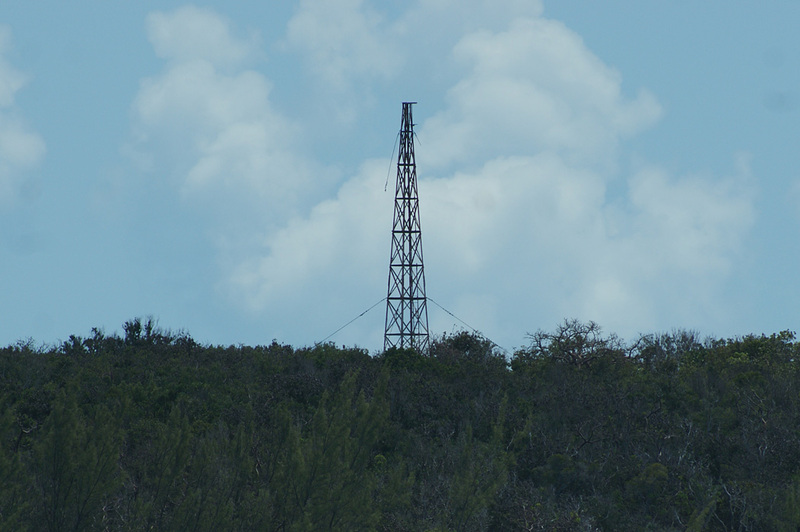 Inactive as of 2013, although still listed with focal plane 34 m (112 ft); white flash every 3 s. 18 m (59 ft) skeletal tower. Trabas has Tom Chisholms's photo, J. Maly has a view from the sea, and Bing has a satellite view. 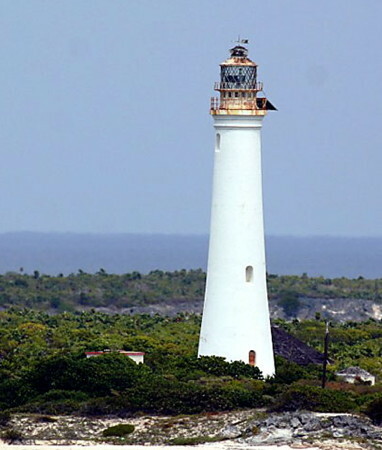 The Chisholms visited the island in 2013 and reported that the light was not active. A developer has plans to build a golf resort on the island. Located at the highest point of the island, off the northwestern tip of Eleuthera. Site status unknown. ARLHS BAH-006; Admiralty J4678; NGA 12200. Date unknown. Active; focal plane 28 m (92 ft); three white flashes every 15 s. 18 m (59 ft) skeletal tower, painted white. No photo available, and Google's satellite view does not reveal the tower. Located on an uninhabited, privately owned island at the north end of Eleuthera. Accessible only by boat. Site status unknown. Admiralty J4682; NGA 12204. Date unknown. 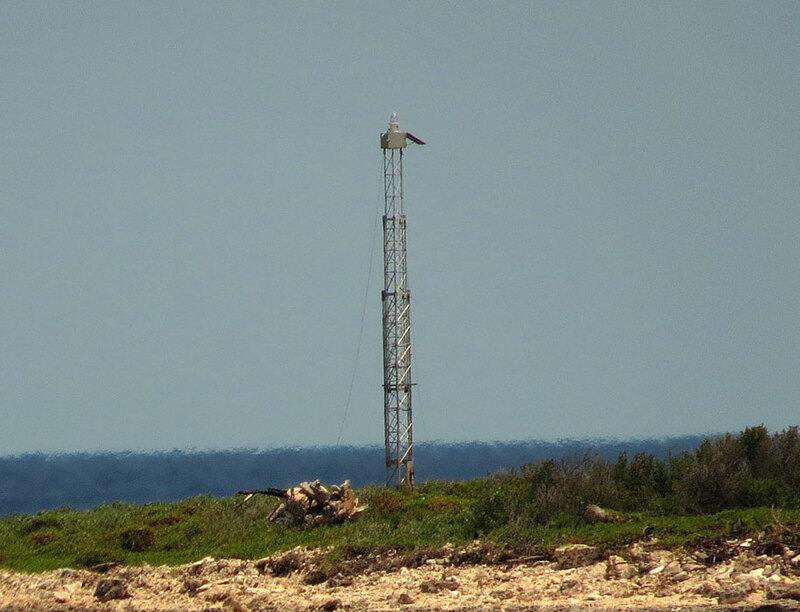 Active; focal plane 12 m (39 ft); white flash every 4 s. 9 m (30 ft) skeletal mast. Trabad has Tom Chisholm's photo and Bing has an indistinct satellite view. Governor's Harbour, on the central west coast, is the district seat for Eleuthera. Located on a point of land at the harbor entrance. Site open, tower closed. Admiralty J4692; NGA 12160. 1992. Active; focal plane 22 m (72 ft); continuous white light with a more intense flash every 5 s. Approx. 10 m (33 ft) square cylindrical wood tower with lantern and gallery rising from the roof of a three-bedroom house. Building available for vacation rentals. Trabas has Tom Chisholm's photo, a 2007 closeup photo is available, and Bing has a satellite view. The lighthouse was built privately by David Steigelman; Lighthouse Digest has a short article describing its construction. Located 4 miles south of Governor's Harbor on the easternmost point of Eleuthera Island. Site open, tower open to paying guests. Site manager: Palmetto Point Lighthouse. ARLHS BAH-013; Admiralty J4705; NGA 12158. Date unknown (station established 1903). Active; focal plane 19 m (62 ft); white flash every 4.6 s. 7.5 m (25 ft) post light adjacent to a 1-story square keeper's cottage. House painted white. A photo is at right, Bill Furry has a 2009 photo, Trabas has Darlene Chisholm's closeup photo, Beth Bullock has a more distant view, Marinas.com has aerial photos, and Bing has a satellite view of this remote location. The keeper's house was in ruins until recently, but the recent photos show that it has been restored. Older light lists show the station originally had two lights on skeletal towers. In 2018 the land surrounding the lighthouse was for sale, and residents of the island mobilized to fight plans by Disney Cruise Lines to acquire it as a cruise ship destination. In March 2019 Disney acquired the land it sought but agreed to donate 190 acres to protect the lighthouse as a national park. 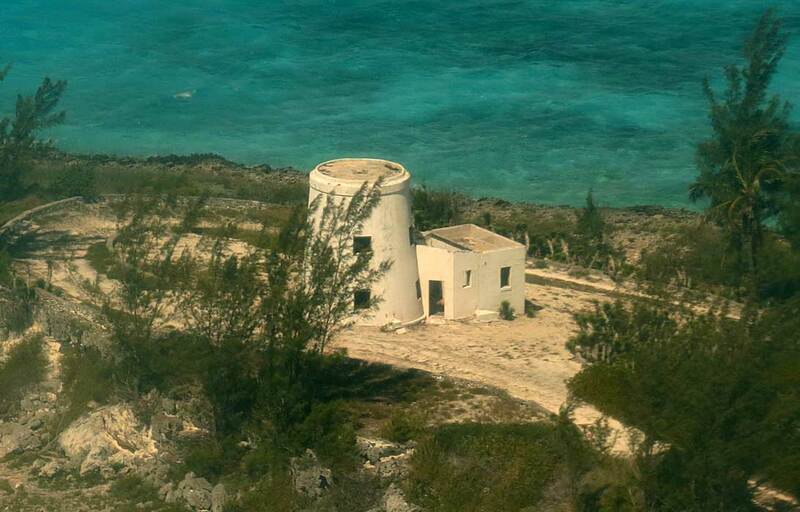 Located atop a bluff on Lighthouse Point, at the southern tip of Eleuthera. Accessible by 4WD plus a hike of about 3 km (2 mi) round trip. Site open. Admiralty J4704; NGA 12208. Note: The Exumas are a long line of cays south of Eleuthera. There are 365 islands but only a few large enough to be permanently inhabited. Date unknown (station established 1893). Active; focal plane 18 m (59 ft); flash every 3 s, white or red depending on direction. 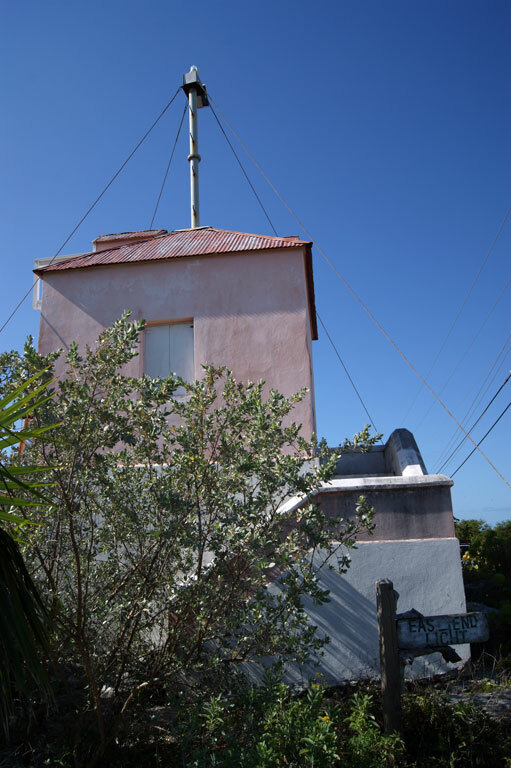 9 m (30 ft) skeletal mast adjacent to the original 1-story octagonal keeper's cottage. The station buildings are unroofed and falling into ruin. A view from the sea is available, Geoview.info has a second view, and Google has a satellite view. The light marks a break in the Exuma reefs that provides an approach route to Nassau from the southeast. Located on a tiny cay about 50 km ( 30 mi) east southeast of New Providence Island. Accessible only by boat. Site open, tower closed. Admiralty J4722; NGA 12116. Date unknown. Active (? ); focal plane 7 m (23 ft); light characteristic unknown. Approx. 7 m (23 ft) conical rubblestone tower, unpainted. A photo and a commercial photo are available, Marinas.com has aerial photos, and Google has a satellite view. This appears to be a historic daybeacon with a recently added light. 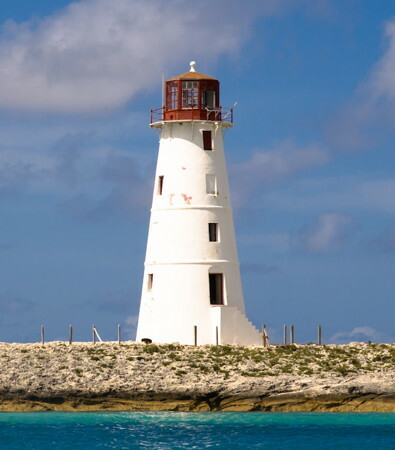 The light guides vessels through a narrow passage into Exuma Sound. Little Pipe Cay is privately owned, but there is a resort on Fowl Cay to the southeast. Located on a reef off Little Pipe Cay, about 12 km (7.5 mi) northwest of Staniel Cay in the Exumas. Accessible only by boat. Site open, tower closed. Not listed by the international light lists. Note: San Salvador is an isolated island of the southeastern Bahamas, about 50 km (30 mi) to the east of the other islands. Traditionally it is identified as the location of the first landing by Columbus in America on 12 October 1492, although recently some historians have questioned this identification. For many years the island was also known as Watling Island, but San Salvador has been its name officially since 1925. 1887 (station established 1856). Active; focal plane 50 m (164 ft); two white flashes every 10 s. 22 m (72 ft) round tapered brick tower with lantern and gallery, painted white. A photo is at right, Erin Cate has a 2008 photo of the station, Steve Nerat has a 2006 closeup, Marinas.com has aerial photos, and Bing has a satellite view. The two original 1-story keeper's houses are still occupied by keepers, who also conduct tours of the tower. Located on the highest point of the island of San Salvador, on the northeastern side of the island. Site and tower open. Site manager: Government of the Bahamas. ARLHS BAH-015; Admiralty J4738; NGA 12288. Note: Crooked Island and Acklins Island together form a "fishhook" enclosing a shallow lagoon called Acklins Bight in the southeastern Bahamas. The permanent population of the two islands is less than 1000, but there are several resorts. Mayaguana, the easternmost island of the Bahamas, lies about 65 km (40 mi) east of Acklins and has a population of about 300. 1876. Reactivated (inactive ca. 1980-1999 at least); focal plane 34 m (112 ft); two white flashes every 15 s. 30.5 m (100 ft) round tower with lantern and gallery, painted white, centered on round 1-story keeper's quarters. Trabas has a good photo by Capt. Theo Hinrichs, there's another page for the lighthouse, Marinas.com has aerial photos, and Bing has a satellite view. The lighthouse was being privately restored by the owners of the Pittstown Point Resort on Crooked Island, and for a time four vacation suites in the light station were available for rental. The resort has since been sold, but the new owners have reopened the lighthouse for tours or casual visitors. A solar-powered lens is now in use. Located on a small island, hardly more than a sandbar, off the northwestern tip of Crooked Island in the southern Bahamas. Site and tower open. Owner/site manager: Crooked Island Lodge. ARLHS BAH-005; Admiralty J4792; NGA 12296. 1868. 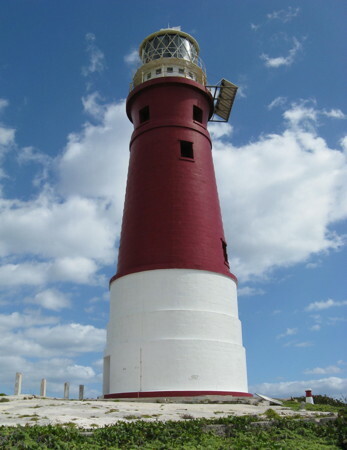 Active; focal plane 40 m (131 ft); two white flashes every 20 s. 34 m (112 ft) round brick tower with lantern and gallery, painted white; 1st order Fresnel lens (1934). The two keeper's cottages and other station buildings are abandoned. Trabas has a good photo by Capt. Theo Hinrichs (also seen at right), Marinas.com has good aerial photos, and Google has a satellite view. Geoff Schultz has posted 2007 photos; at that time the lighthouse was freshly painted on the outside but appeared deteriorated inside. Probably endangered. Until recent years this lighthouse was painted with red and white horizontal bands. Located on a small island off the southwest tip of Acklins Island. Accessible only by boat. Site open; Schultz found the tower open. Site manager: Bahamas Port Department. ARLHS BAH-001; Admiralty J4782; NGA 12324. Date unknown (station established 1925). Active; focal plane 21 m (69 ft); white flash every 5 s. Approx. 8 m (26 ft) post mounted on a round stone base. A square 1-story keeper's cottage stands in ruins nearby. No photo available but Google has a distant satellite view. The original light here was a 10 m (33 ft) skeletal tower. Located on a bluff at the northwestern point of Mayaguana (not at the northeast point, as stated on the photo caption). Site open, tower closed. Admiralty J4798; NGA 12352. 1839. Inactive since the 1940s. Approx. 18 m (60 ft) ruined round stone tower with lantern and gallery. This abandoned lighthouse formerly marked the southern entrance to the Florida Straits from the Gulf of Mexico. 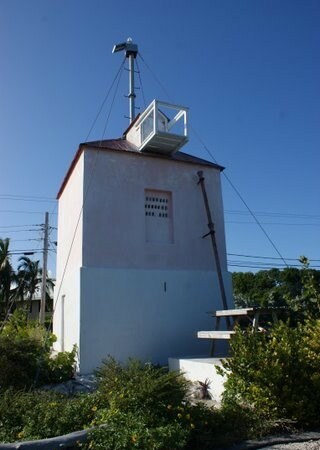 It was briefly reactivated during the 1970s, when Bahamas police had a post on the island to watch for drug smugglers. The tower is badly deteriorated. 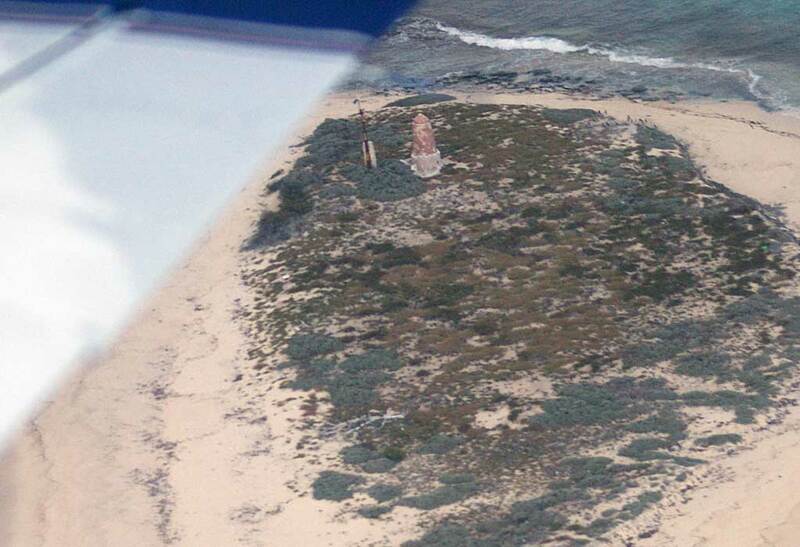 Gregory Gulik has a report from his visit in 2001, a 2007 photo and a second photo are available, Lighthouse Digest has a photo by Oscar Reyes, and Google has an indistinct satellite view. Obviously endangered. Located on North Elbow Cay, at the western end of the Cay Sal Bank about 80 km (50 mi) off the Cuban coast and 130 km (80 mi) southeast of Key West, Florida. Accessible only by boat. Site open, tower open but extremely hazardous. Site manager: unknown. ARLHS BAH-018. 1869. Active; focal plane 44 m (145 ft); two white flashes every 20 s. 45 m (148 ft) round cast iron tower with gallery, painted white. 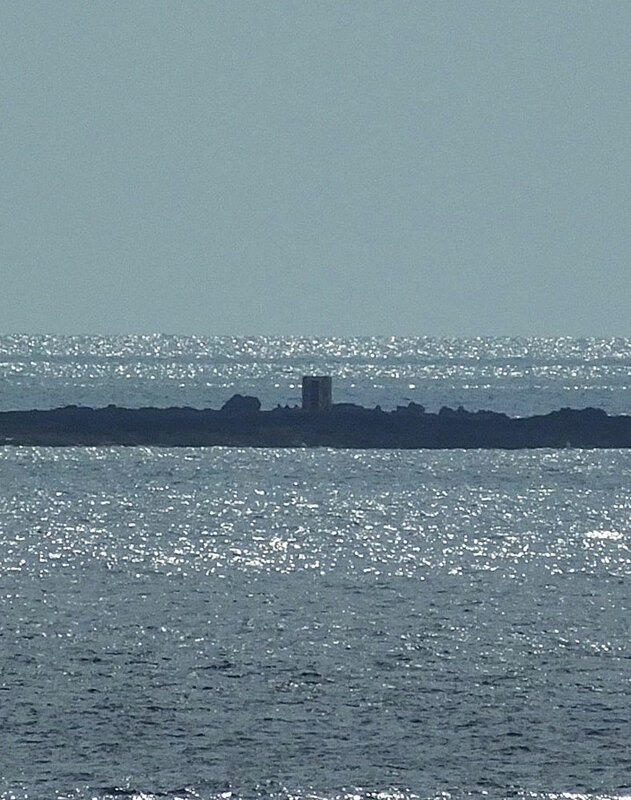 The lantern has been removed recently, as seen in Wikimedia's 2017 view from the sea. Timothy Wildey has a photo, Trabas has a view from the sea by Capt. Theo Hinrichs, and Bing has a good satellite view. The tiny cay, a famous hazard to navigation, is located only a short distance off the north coast of Cuba, but it is owned by the Bahamas. Cruise ships pass the cay regularly, and their passengers are usually astonished by the lighthouse as it seems to rise directly out of the ocean ahead of or beside the ship. The lighthouse was ordered by British colonial authorities and completed in 1869. 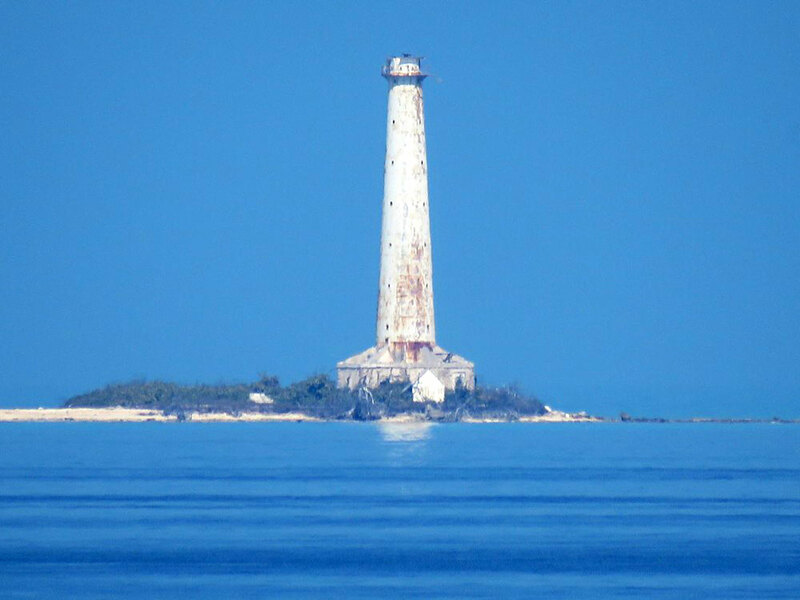 For lighthouse keepers it was the most isolated posting in the Bahamas. Today the light is automated and solar-powered. 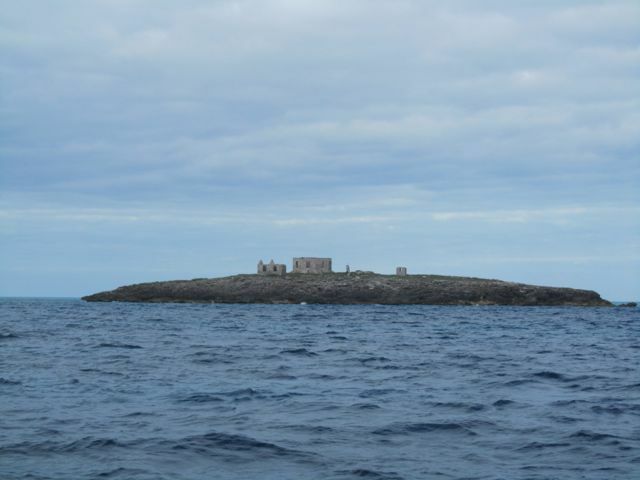 Located on a cay in the Old Bahama Channel only 50 km (30 mi) from Cuba. Site and tower closed. Site manager: Bahamas Port Department. ARLHS BAH-011; Admiralty J4774; NGA 12344. Note: The Inagua Islands are the southernmost island group of the Bahamas. The largest island, Great Inagua, is the third largest island of the archipelago, roughly 90 km (55 mi) long and 30 km (19 mi) wide. The permanent population is only about 1000, most of them in Matthew Town on Great Inagua. 1870. Active; focal plane 37 m (121 ft); two white flashes every 10 s. 34 m (112 ft) round masonry tower with lantern and gallery, painted white. Two octagonal keeper's houses occupied by keepers. Patrick Wilson's photo is at right, a 2008 closeup photo is available, Trabas has Tom Chisholm's aerial photo, Joaquin Iglesias has a 2017 aerial photo, Huelse has a historic postcard view, and Google has a satellite view. Located at the southwestern tip of Great Inagua Island near Matthew Town. This location is about 100 km (60 mi) northeast of Punta Maisí, the eastern tip of Cuba. Site and tower open (free, donations requested). Site manager: Bahamas Port Department. ARLHS BAH-007; Admiralty J4804; NGA 12360. Athol Island (1875-? ), northeast side of New Providence Island. The light was in a cupola atop the quarantine office. Google's satellite view shows there are no structures on the island today. Coco Cay, Berry Islands west of Great Stirrup Cay. This light was built by Royal Caribbean Cruises, which owns the island. It may be active, but it is not recognized as an aid to navigation. Andres Henao has a street view and Google has an indistinct satellite view. 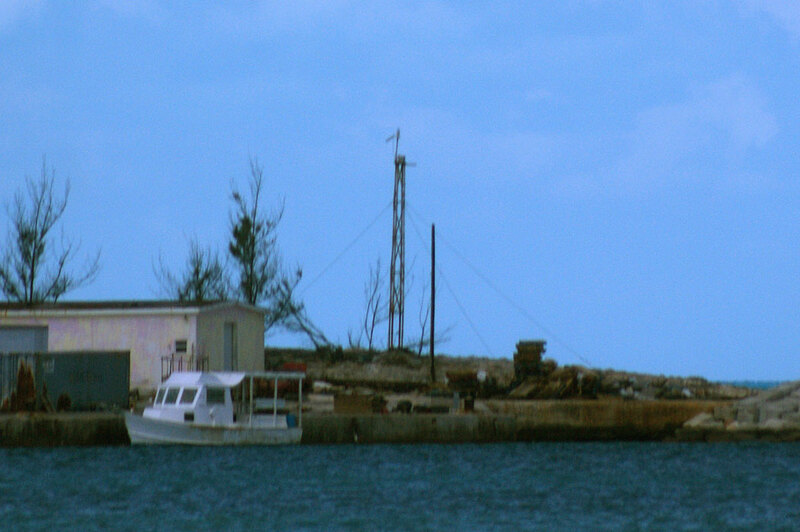 Crystal Cay, off Long Cay near the entrance to Nassau, is not listed as an aid to navigation. Bing has a satellite view. 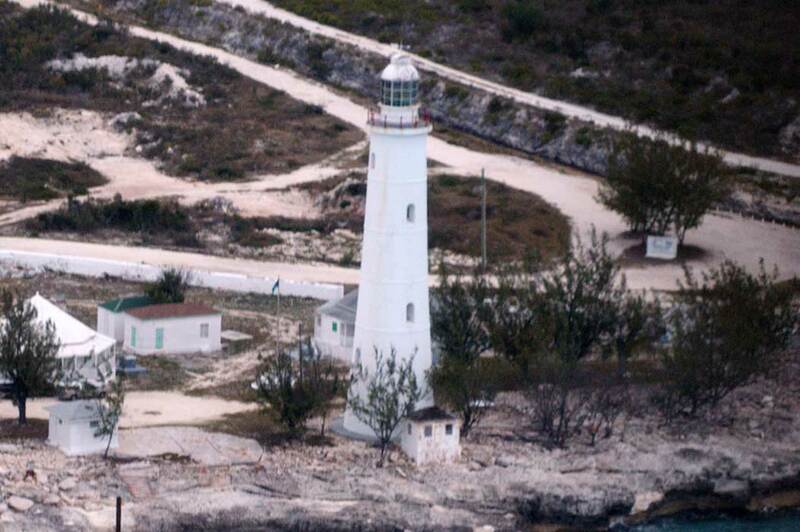 High Rock (1998), Grand Bahama, was built by Rev. Cecil Kemp of the nearby Lighthouse Chapel; it is not an aid to navigation. Andrew Conway has a closeup, Terence Lin has a 2018 photo, and Google has a fuzzy satellite view. Little Whale Cay, Berry Islands. As far as I know this tower never had a light. Google has an indistinct satellite view. Lucaya, on Grand Bahama, is purely decorative and not an aid to navigation. Bill Estes has a nice view and Bing has a satellite view. Solomons, at the northeastern point of New Providence Island, Nassau, is not listed as an aid to navigation. Bing has a satellite view. Sun Cay, Nassau, off the northeast side of New Providence Island, is not active. John Dawson has a photo and Google has a satellite view. Posted May 2005. Checked and revised November 12, 2018. Lighthouses: 30. Site copyright 2018 Russ Rowlett and the University of North Carolina at Chapel Hill.